On 18 May a ringing session was held at Thulasihleka Pan in Richards Bay, South Africa, attended by members of BirdLife Zululand. 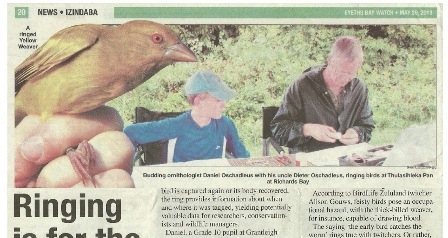 The youngest attendee was 15-year old Daniel Oschadleus who has been training to become a bird ringer. During, and after, the ringing session Daniel was interviewed by reporter Angela Kelly about bird ringing, and the article appeared in the local newspaper, Eyethu Bay Watch on 29 May (download a pdf of the newspaper article here). On the morning of 18 May a total of 94 birds were caught, of 18 different species. The top two caught species were Yellow Weaver (33), and Lesser Masked Weaver (also 33). One Lesser Masked Weaver was a recapture - it had been ringed in 2004 and was later discovered to a new longevity record for the species, being at least 9 years old (read more here). Thanks to the members of the bird club who came to watch and help, especially Alan van Zyl, Tina Lickford, and Daniel Oschadleus.